Technology plays a vital role in a Saint Peter the Apostle Catholic School education for students in pre-kindergarten through eighth grade. 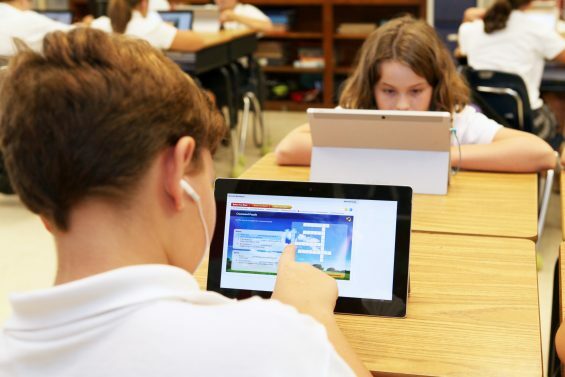 All students attending St. Peter’s receive formal instruction on computer applications and technology is integrated into our core curriculum. Core curriculum instruction is enhanced through technology: SmartBoards in every classroom. Technology serves our St. Peter the Apostle Catholic School community by providing parents with portals to communicate with teachers through EdLine with up-to-date grade status reports, and a fully updated school website. In order to stay cutting edge in the world of technology, the infrastructure of St. Peter the Apostle Catholic School was built with wiring to support a growing technology program for years to come.